With only two days notice, I was asked on a late Sunday afternoon last December if I could please help with decorating a very important staff drinks party. of course, I would love to help you,!! 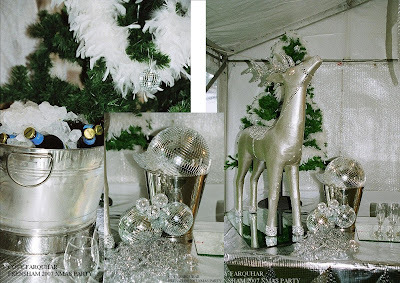 My ideas were very simple, they had to be as I had very little time , BUBBLES.........make the champagne look VERY important on the night with most of the tent area dedicated to an ice bar for everyone to stand around. 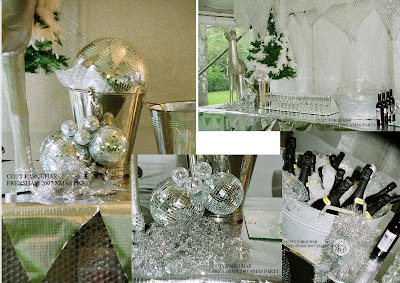 BAUBLES,,,,,, buy, find, borrow as many mirrors balls and balls to fill the area. I had one colour theme for the night, which was to be silver, which I love very much. 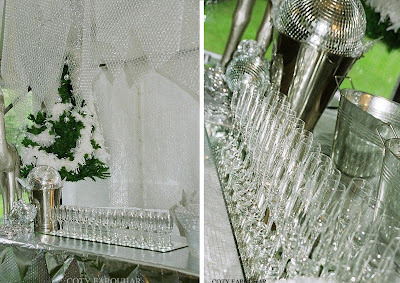 Silver buckets for the champagne bottles and drinks and ice. Glasses on silver backed mirrors placed on the bar for a major effect, silver builders insulating paper on a roll which covered the whole bar, waterproof and disposable. This is fabulous stuff to work with, it moulds around anything you want and cuts beautifully. But the best and cheapest stuff that I used was Bubble wrap,,,,,,,,,,,,,,, (more bubbles than you can imagine), I bought this huge roll, (the biggest roll that I could fit in my Van) and I wrapped everything in bubble wrap, I hung it from wire and shredded the bubble wrap into shapes of icicles, very, very easy to cut on the spot once it was hung, I also made bubble aprons for the waiters to wear over their black outfits. It looks so good with light coming through it as well. Best of all, it was all recycled and used in the craft shop the following year. 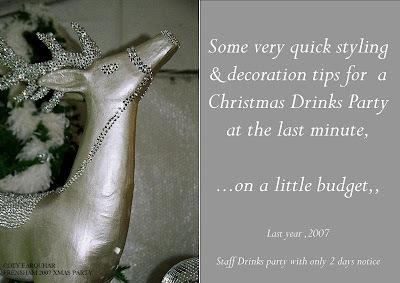 I borrowed a wonderful silver reindeer from a good friend's shop display, which I returned by the very next morning. 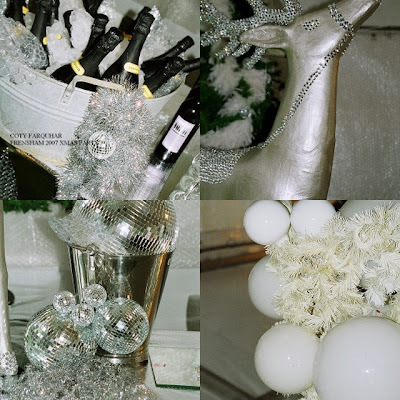 I found a little fake Chistmas tree which sat up on the bar decorated with a white feather boas which took very little time to put in and a few more mirror balls. Believe me,,,, this was one of the quickest jobs that I have ever done, it was sooooooo easy, cheap and I thought it would be nice to share it with you before this years Christmas rush. Labels: TABLESETTINGS ENTERTAINING AND FOOD, WEDDINGS AND EVENTS. Good morning Coty...you did a wonderful job there, it looked stunning. Those lucky teachers! I think that was the very school i was threatened with (boarding school) when i was being a rebellious teen so many years ago. Now i look at it i WISH i went instead of digging my heels in!